Hello Hallowe'ers! August is streaking by like a lightning bolt as I count down to our Online show! So, what are our trick or treat artists up to? And me? Like many of our 18 (so far) participating artists, I'm busy making something spectacular to share with you all on October 1st! 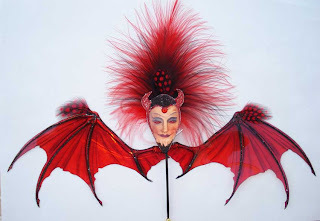 These wings and mask were the inspiration... A costumed she-rat is in the making!